Please visit www.local-development.eu for details of the new programme. A LEADER-funded event at the end of November will allow visitors to witness Crathes Castle as it has never been seen before. 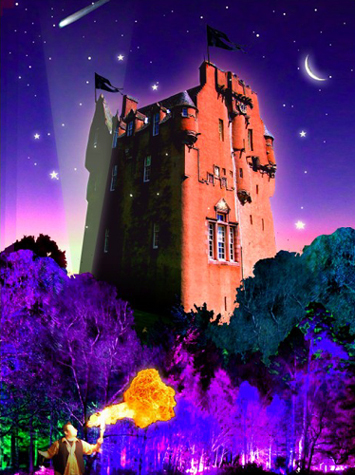 'The Enchanted Castle' will be held at the Royal Deeside castle between Wednesday 23rd and Sunday 27th November. The event had been planned for December 2010 but extreme winter weather forced its cancellation. Visitors will make their way through Crathes's woodland policies which will be dramatically lit by brightly coloured lighting. It will feature cutting edge light and sound technology and stunning choreographed effects, moods and backdrops that will be a ‘must’ for family members of all ages. In addition to the evening walk, which will take place in a truly magical ambience, a host of complementary, themed attractions including storytelling sessions by the award winning author Deborah Leslie, fire breathers and jugglers, magicians, and children’s enchanted craft activities, will all add much to the magical experience. There will also be a unique opportunity to partake in a 'ghost tour' of the castle itself. A special menu featuring local produce will be served in the National Trust for Scotland's Courtyard Restaurant. Tickets can be purchased through Aberdeen Box Office. A LEADER funded event which promoted rural industries and skills was declared a resounding success after a big turnout at the weekend. 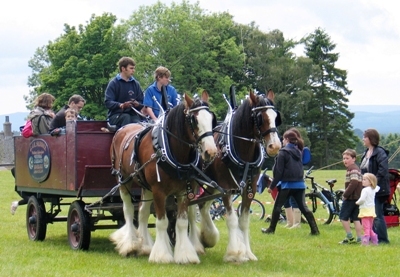 Over 4,000 turned out at ‘Countryside Live’ on Sunday 12th June, an event organised by the Royal Northern Agricultural Society and held at Dunecht Estate. In partnership with local rural and land-based organisations, the project aimed to showcase farming, food production, land management, rural crafts and skills to the general public and provided an enjoyable and educational day out for all age groups. In addition to the public event a second day was held for local secondary school children which attempted to educate and involve them in rural industries. In March the project was awarded £18,042 as part of Round 11 of the Rural Aberdeenshire LEADER programme. As well as LEADER, the project is supported by Aberdeenshire Council and a large number of agricultural and rural businesses. 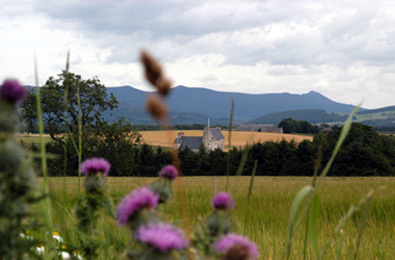 Dunecht Estates, a 2700 acre farming and sporting estate 13 miles west of Aberdeen provided several locations on a number of different farms. The event encompassed a wide range of attractions comprising farmers market, cropping, livestock, forestry, sporting and recreational areas, conservation and land management displays. 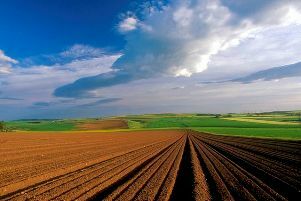 Estate activities included arable cropping, livestock production, game birds and environmental management schemes which improve biodiversity with benefits for wildlife, farmland birds and other flora and fauna. Visitors experienced what farmers do to produce quality, farm assured food and actions to protect the environment and maintain an attractive, living countryside. Over 100 volunteers acted as stewards ensuring smooth operation of the day and a shuttle service was provided to access each demonstration area. The second day was targeted at secondary school pupils focusing on rural industries with technical experts on hand advising on employment opportunities in the rural sector through livestock and arable farming, agricultural research, estate management and quarrying. The first day proved highly popular with 4000 attendees enjoying the informative event. 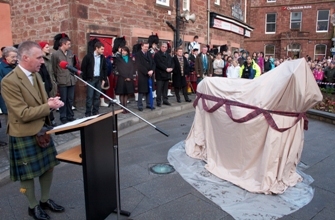 Many thanks for inviting me here this afternoon to help celebrate the unveiling of this true emblem of Turriff’s history. I know that it has been a long and at times an arduous journey to get here, and that there have been setbacks along the way. I have to admire the tenacity of the Turriff Tourism Action Group for sticking with their ambition to bring the Coo back to Turriff. And here she is – proud, if not very tall and immortalised in bronze. Little did she suspect way back in 1914 that she would be here today, standing in the spotlight, bedecked in ribbons and at the centre of the world’s attention. The Coo has certainly caught the imagination of the whole community and through their involvement in the project young and old have been able to be part their parts. I know that the education programme was very important to the project and that all faculties of the Academy, and the local Primary Schools have benefitted greatly as have the residents of Dawson Court who fashioned the flowers for the Coo’s garland. I would like to thank the three artists – David Blyth, Charles Engebretsen and Ginny Hutchison for their efforts not only in presenting the sculpture but also for their work on the education programme. 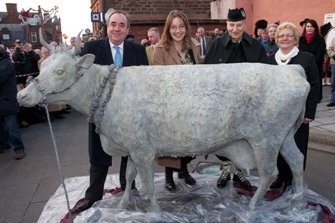 The Coo is more than just a sculpture, it is a symbol for the town, its self-belief, its ambition and it’s welcome. It helps define Turriff as a place with a history, a heritage, and a sense of place. 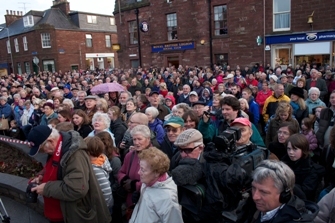 The project has also caught the imagination of a very wide range of funding bodies including the Scottish Government and the European Community Rural Aberdeenshire LEADER Programme (2007-2013), The McRobert Trust, The Mary Salmond Trust, Turriff & District Ltd and the numerous private and personal supporters who have contributed amounts large and small.  I am pleased that Aberdeenshire Council has been able to support the Coo’s return to Turriff also not only with some funding but also with advice and support. I would like to mention Saskia Gibbon, one of our Arts officers for the role that she has played throughout the life of the project. You will see that we have been upgrading the town centre to welcome the Coo back to Turriff, these works were funded by the Council and using some Planning Gain monies. Stuart Andrew of our Roads Service designed the new look “Coo Corner” so thanks to him and his colleagues also for their efforts. There are too many people to thank in person, I would just like to acknowledge all those who have contributed during the past five years to the project, and have helped make today such a great community event. A special word for the Turriff Tourism Action Group, and in particular, to Kate Ferguson and Yvonne Milne for all of their efforts and dedication to the project. I know how much time you have put into this. Well done everyone, have a great Christmas and best wishes to the Coo, to you and to Turriff. The Seminar was held to explore the potential for rural development funding available to rural communities, groups and organisations. The seminar was well attended and delegates heard direct from LEADER participants about their projects. Dennis Helliwell, Insch Institute Bowling Club, gave a fascinating presentation on the development of a project from initial concept to submission of multi-agency funding applications. Sheila Stuart, Royal Northern Countryside Initiative, explained the role of the organisation in increasing countryside awareness through education and provided feedback on the highly successful Countryside Estate Day held at Ballogie on 10 June 2010. Hebbie Fowlie, Strichen Community Park Company, informed delegates of the group's recent success, not only through LEADER Fuding but through Heritage Lottery funding, towards a Community Cafe which will be established within the Park. Richie Miller, Deveron, Bogie and Isla Rivers Trust, explained about the environmental enhancement and protection work that is being undertaken in the river catchments and also about initiatives to promote tourism in the Deveron area. A large number of stalls displaying projects were very well received by the delegates. A very big thanks to all who contributed to the event and in particular to Ewen Cameron of Scottish Natural Heritage for chairing the event. Brian McDougall and Garth Entwistle from Udny Community Council with Dr Eleanor Anderson, Aberdeenshire Federation of Rural Partnerships and Local Action Group Member. Tony Brown, Banchory and District Initiative and Mike Powell, Marr Area Partnership. Donald Boyd gave an interesting presentation on the work of Huntly Development Trust. The Portrait of Our Time exhibition of photoraphs which capture the daily lives of residents of Ballogie, Birse, Finzean and Strachan will take place at the Birse & Feughside Parish Church in Finzean from 12 to 20 September 2009. Artist Mel Shand who photographed the local residents will lead tours of the exhibition. LEADER project details about Portrait of Our Time can be accessed here. 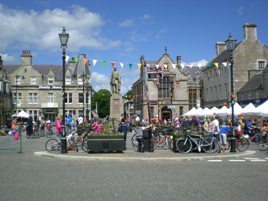 The Fyvie Homecoming Festival, (for LEADER project details click here), scheduled 28-30 August 2009 is shaping up to be a full weekend of family and visitor entertainment based on the distinct culture and heritage of the Fyvie area. The event, project managed by Anne Iravani, is proving to be very popular with locals and visitors alike. LEADER will be represented at the Community Garden Party which will be opened by the First Minister at 1.15 pm. Details on the festival can be accessed by clicking here. 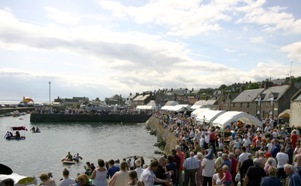 August 2009 - Johnshaven Fish Festival, supported by Rural Aberdeenshire LEADER Programme, a resounding success! 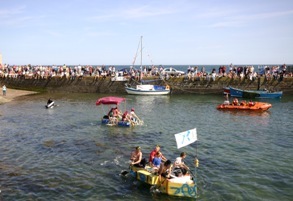 An estimated 3000 visitors attended the annual Johnshaven Fish Festival on Saturday 8th August, all sharing the spectacular weather in and around the picturesque harbour area. Throughout the day, they enjoyed browsing the arts, crafts and fundraising stalls, sampling a variety of seafoods, including fresh hot smoked salmon from nearby Gourdon and listening to an eclectic range of musical entertainment from sea shanties to thumping blues rock. 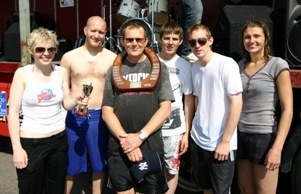 As the afternoon closed, the sun soaked crowd lined the harbour walls as ‘Neptune’ and ‘Father Ted’ duelled for the coveted toilet seat in the final leg of the raft race ahead of the pursuing fleet, and Timo Gross and his band headlined the main stage. ‘Moonbeam’ and the RNLI’s inshore fast rescue craft made a stunning entrance on the later tide as Standby, Johnshaven’s favourite young band closed the show with some popular numbers from their set. The fantastic mix of entertainments, exhibits, food and community spirited organisation made for another successful event, boosting funds for local groups and promoting the South Aberdeenshire coastal region as a great place to be on such a glorious day. 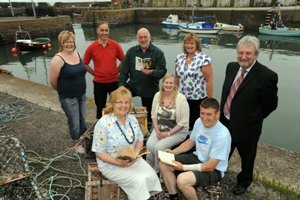 The Johnshaven Fish Festival is supported by the European Community Rural Aberdeenshire LEADER Programme and the Scottish Government. The generous support provided by LEADER allows the event organisers to allocate significantly more monies from proceeds towards the Fish Festival local Community Good Fund. The Rural Aberdeenshire LEADER Programme was represented at the 2009 Turriff show with a stand in the Lifestyle Marquee. The site has been cleared for the construction of a new Exhibition Hall which will be part-funded by LEADER (for LEADER project details click here). Vicky Thomson, Aberdeenshire LEADER Co-ordinator. Held over two days, the Turriff Show is the biggest agricultural event in the North East of Scotland and this year the show was a major event in the Homecoming 2009 calendar. The LEADER stand was busy and well attended by project participants and new enquiries being made. A new initiative, “Mearns Connections", with the theme in 2009 of Burns in the Mearns is holding its inaugural arts festival on the 14th, 15th and 16th of August will see the celebration of some of Scotland’s most revered artists: Lewis Grassic Gibbon, Joan Eardley and Robert Burns, in the 250th anniversary of his birth and in the year of Scotland’s Homecoming. The event, centred around the Grassic Gibbon Centre in Arbuthnott in Kincardineshire, is the result of a collaboration of local arts and specific interest groups keen to see the works of local and international artists showcased in the heart of the Mearns, an area that directly inspired the works of writer Lewis Grassic Gibbon and artist Joan Eardley through the power and endurance of the land and sea, and additionally was the birth land of Robert Burns’ father, William Burns and generations before him. These intertwined connections were the ground roots for the inception of the festival which, in its composition, is aimed at emphasising the importance of the area to writers and artists throughout the years and brings top quality artists to a weekend of literature, music, art, photography, ceilidh-dancing, oratory, singing, arts & crafts work shops, community involvement and, above all, enjoyment and celebration. The Friday night Mearns Connections Dinner will feature speakers Jack Webster and Richard Demarco who will provide an insight into Lewis Grassic Gibbon, Joan Eardley and Robert Burns and their relationship and connections with the land and the sea. There has probably never been an evening where one company has celebrated these three artists together under one roof. A copy of Sunset Song signed by Ewan McGregor, who was named after Ewan in Sunset Song, will be raffled during the evening. The North East’s world-famous fiddler Paul Anderson, alongside Shona Donaldson and Geordie Murison, will provide the musical entertainment. The inimitable and erudite Mr Jim Brown, MBE, will chair the evening with his usual flair and conviviality. The entertainment on Saturday night will be headlined by Emily Smith, Scots singer of the year in 2009, supported by the local Grassic Gibbon Songwriting Group and ceilidh band Tangleha’. Throughout the day several workshops for adults and children will take place on songwriting, poetry, painting and drumming. There will be a unique opportunity to see excerpts from the BBC’s adaptation of Sunset Song in ‘Sunset Song Sensations’ on Saturday and Sunday mornings and there will also be an illustrated talk by Andy Hall on his latest book “Touched by Robert Burns”, launched at Edinburgh Castle on St. Andrew’s Night by Scotland’s First Minister. Sunday morning heralds the much anticipated launch of “The Mearns Distilled”, a unique publication by photographer Andy Hall and artist Francis Boag where they celebrate the Mearns through the eyes of a photographer and a painter. Sunday afternoon brings a showing of a DVD on the life of William Burnes entitled The Father of the Bard, developed as a special project to include people with learning disabilities, and musical entertainment by the local community-based Burns Quoir singing the songs of Robert Burns. Bringing the festival to a very special climax, the internationally famous actor John Cairney will deliver his masterpiece on Scotland’s International Bard, “A Burns Experience”, a performance perfected after 50 years of playing Robert Burns at home and abroad. For further information and tickets, contact Isabella Williamson at the Grassic Gibbon Centre on 01561 361668 or visit the festival website at www.mearnsconnections.com. 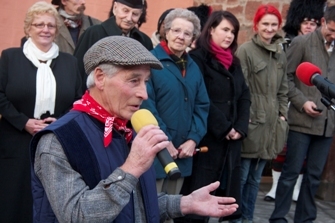 Two summer events supported by the Rural Aberdeenshire LEADER Programme include the Johnshaven Fish Festival and a new initiative, Mearns Connections, with the theme in 2009 of Burns in the Mearns. The Johnshaven Fish Festival on 08 August is a popular event celebrating the heritage of the small coastal community which has a strong legacy of inshore fishing at its heart. With lobster and crab boats fishing regularly out of Johnshaven, the local processing factory generates local employment and the coastal village is a popular destination for folks with connections to the sea. On 08 August, the festival will include local stalls & products, music entertainment, family fun and attendance by RNLI lifeboat. A new element in the festival in 2009 will be the introduction of a free shuttle bus from the car park located at Lathallan down to the harbour area. This will reduce congestion and benefit visitors to the event. 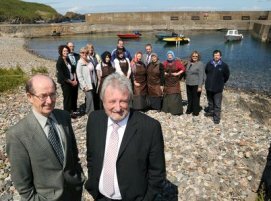 “Rural and coastal communities across Aberdeenshire continue to benefit from a diverse range of projects brought forward by local groups, partnerships and public sector partners. “LEADER is contributing to the development of community facilities within settlements, environmental education and habitat improvement projects. “The programme also funds feasibility studies so that groups can take steps to assess the viability of larger projects. A new initiative, Burns in the Mearns, is a weekend festival taking place from 14 to 16 August at the Grassic Gibbon Centre. The arts initiative is managed by The Friends of the Grassic Gibbon Centre under the banner of ‘Mearns Connections’ and ties into Homecoming 2009. The aim is to attract local and international visitors and promote the work of poet Robert Burns, writer Lewis Grassic Gibbon and artist Joan Eardley – all of whom were inspired by the beauty of the area. TiV, a three year programme of cultural arts events and projects in and around Huntly is supported by the Rural Aberdeenshire LEADER Programme. The initiative is focusing on social engagement with the community through eleven individual projects involving artists in residence. TiV has four main strands namely intergenerational understanding, environment, heritage and identity. 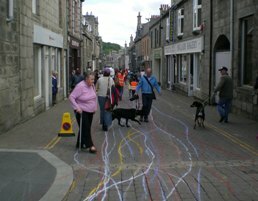 The Slow Down Festival held in June 2009 was highly successful with a busy programme including talks on the history and culture of outdoor access, Nordic Walking for Beginners, walks around Huntly and a special Slow Down Cycle Parade that created street art from cyclists plotting their route through the Huntly streets. The Rural Aberdeenshire Local Action Group (LAG) held a celebration event on Tuesday, 9 June at Sandend Harbour to mark a successful year which saw the programme provide over £1million in funding to rural projects across Aberdeenshire. The programme was launched in June 2008 and has contributed a total of £1.37 million of funding towards 46 projects that will inject over £6 million into the local economy. To mark the first year’s achievement, the group visited Sandend Harbour which will shortly undergo restoration works part-funded by LEADER and LAG representatives also met local dramatic group, the Portsoy Players. “LEADER contributes to the creation and development of community facilities and social hubs within settlements, environmental education and habitat improvement projects. “LEADER funding not only looks at rural activities but has included events and festivals linked to Homecoming 2009. As a result it is helping to promote local food and craft products and initiatives that focus on the cultural heritage of local communities. 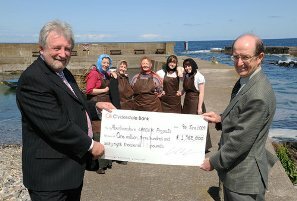 Raymond Murray, Honorary Secretary of the Sandend Harbour Trust said: “The award of £18,000 from the Rural Aberdeenshire LEADER Programme has delighted members of The Sandend Harbour Trust Company and residents of Sandend. 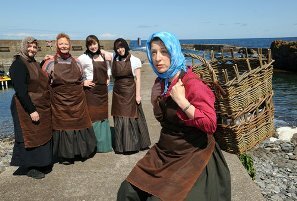 Representatives from Portsoy Players, dressed in traditional clothing joined the celebrations at Sandend to highlight the importance of fishing communities throughout the Banff coastal area. The Rural Network Unit of Finland organised a Seminar for LEADER enthusiasts from across Europe in March 2009. The main focus of the three-day event was to meet with LAGs from other member states and explore opportunities for co-operation and joint projects. Located well within the Arctic Circle, the Seminar was held at Levi which is a modern, highly popular tourist destination where outdoor sports and the natural environment are key to community wellbeing and the local economy. The event was scheduled 16-20 March 2009 which enabled winter activities to be experienced, but moving from the long, dark winter nights towards the spring, daylight hours were not restricted to any extent. As new participants in LEADER 2007-2013, Rural Aberdeenshire Local Action Group was given the opportunity to attend the event. 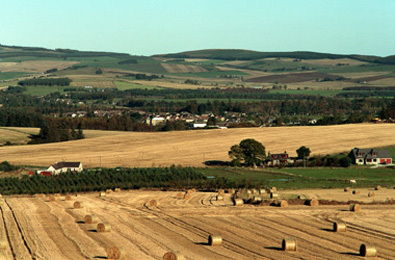 Although the LEADER programme is very active in the Rural Aberdeenshire area, the LAG has not, as yet, been involved in any transnational projects. The LEADER seminar in Finland therefore provided a very useful opportunity to meet with other LAG representatives. Key points from the event are that Finnish LEADER Action Groups are highly focused and motivated and have a strong ethos of partnership working within Finland and trans-nationally with other Member States in Scandinavia and the Baltic Countries. The Finnish LAGs have a pro-active, can do attitude, ensuring that wide community benefit which not only considers the environment, but stimulates the local economy, can be delivered through LEADER. Although we are still in the first half of the 2007-2013 LEADER progamming period, it was clear from discussion held at the Seminar that LEADER methodology is a concept that should be maintained, developed and expanded upon post 2013. While the prospect of joint projects is initially attractive to many, bringing forward such projects in a practical sense does require time, co-operation, commitment, with clear aims and objectives for participating groups. With a period of refection following the Seminar, partner searches for co-operation projects are now being made. Through tactical organisation, which at times was challenging with a busy schedule, the Seminar worked like clockwork. The Rural Network Unit of Finland managed to deliver a highly focussed, highly successful event wich encompassed policy, practice, negotiation, participation and a lot of fun. The Finns are passionate about rural development and local delivery and can demonstrate practical application through numerous case studies. Networking was highly informative, each event, activity or discussion topic meant you were meeting new people all the time, exchanging views and ideas. Field trips were excellent, not only in terms of enjoyment but also through experiencing first hand the types of projects that LEADER has had a positive impact on in Lapland. For example, visiting Loma-Paksu was an opportunity to see how local businesses can work in collaboration. The local heritage and culture of the area was well evidenced with participants enjoying sled rides facilitated by a local reindeer farm. Moving to mechanised transport in the form of ski-doo sled, there was opportunity to meet with Santa in his Grotto in the woodlands. Local culture, food and crafts were all on offer and the icing on the cake was a display of the Northern Lights prior to returning to Levi. Alli took delight in explaining local culture and the history of this interesting area. Enthusiastic and qualified guides ensured all attendees had a really worthwhile experience in meeting Alli and undertaking the activities at Lomapallas at Torassieppi. A second excursion into a remote area close to the Swedish border, again demonstrated how local culture and heritage is key to the tourism industry in Lapland. Alli Ohenoja runs an impressive business, Lomapallas at Torrassieppi which traditionally had been a reindeer farm and now includes activities such as cross-country skiing, snow shoe activities, husky sled rides, reindeer rides, tourism accommodation and opportunity to explore the pristine environment. For a business that has a staggering through-put of visitors throughout the year, Alli’s professional approach was evident through her welcoming manner. 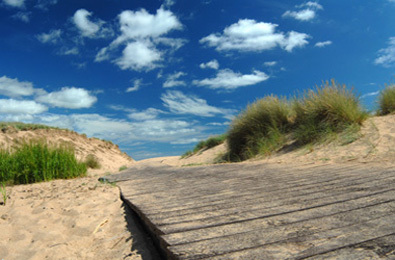 LEADER has been in operation in Aberdeenshire since June 2008. To date the Rural Aberdeenshire LAG has approved 24 projects which have been awarded a total of £575k. One of the key aims of the LEADER Programme is to network and share project concepts and ideas with other rural communities, i.e. promote transferable skills and ideas. Two Community Seminars are being held in the South of Aberdeenshire, the first at the coastal village of Johnshaven and the second at the rural village of Auchenblae. An exciting, innovative winter event is being held over the weekend of 12, 13 and 14 December 2008 at Glen Tanar with a series of free family events and activities in Aboyne. This event has been sponsored by Aberdeenshire Council, Scottish Enterprise and The Cairngorms National Park Authority. 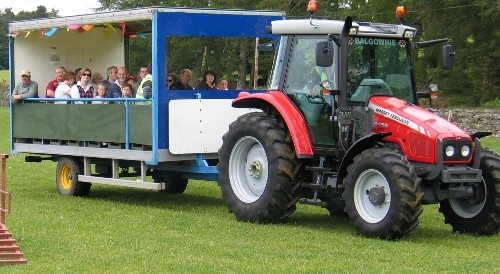 Rural Aberdeenshire LEADER is pleased to support the weekend community events at Aboyne. The Rural Aberdeenshire Local Action Group was represented at the Turriff Show on Sunday 3 and Monday 4 August 2008. 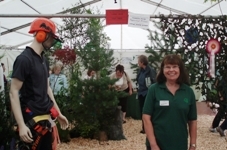 An impressive display set up by Forestry Commission Scotland won first prize in the "Large Trade Stand" category. Scottish Government officers from the Grampian Area Office were in attendance promoting the Scotland Rural Development Programme to a large number of interested visitors. There were several enquiries to LEADER and these are now being followed up.